A California appeals court has sanctioned the California Department of Forestry and Fire Protection’s (CalFire) regulation, as “timberland,” of land containing no trees and zoned for residential development. PLF filed an amicus brief in the case—representing Del Norte County, Del Norte Association of Realtors and the California Association of Realtors—pointing out the many problems with this rule. Under the Forest Practice Act, CalFire can regulate “timberland,” land that is both “available for” and “capable of” growing a crop of trees. PLF’s brief argued that by asserting jurisdiction over two parcels already zoned and subdivided for residential development, CalFire ignored the “available for” requirement in the statute. Rules of statutory construction, and a 2006 California Supreme Court opinion, require that the phrase “available for” carry independent meaning. In other words, land is not timberland merely because it is biologically capable of supporting a crop of trees; it must also be available for timbering. And land that is already developed — or being used in another manner incompatible with timber operations — does not satisfy the statute’s “available for” requirement. If all that is required is the biological capacity for growing a crop of trees of a commercial species, every parcel of California where the underlying soil composition is theoretically capable of supporting such a crop is ‘timberland,’ subject to CalFire’s jurisdiction. Even land in fully developed, urban areas replete with houses, office buildings, department stores, and every other mainstay of urban living, would fall within CalFire’s broad sweep, provided the underlying soil qualified. The court acknowledged this reality—even quoting directly from our brief in its opinion—but nonetheless sanctioned CalFire’s definition because the agency wasn’t acting as outrageously as the examples we provided in our brief on this particular occasion. The court seemed to forget that jurisdictional statutes, like this one, have broad-ranging impacts on many people—and the fact that a particular interpretation sanctions absurd results is a reason to reject it. Fortunately, the court’s decision is unpublished, which lessens its impact on other courts in the state that may consider this same issue. But unfortunately, the plaintiffs must jump through more regulatory hoops to develop their property. That, in turn, is bad news for Del Norte County and its residents. The County desperately needs these two parcels developed into residences in order to satisfy its state-mandated affordable housing quota. Nearly 80% of the County’s land is already owned by the state or federal government, which leaves very little room for housing. Because the court sanctioned a definition of “timberland,” which gives CalFire regulatory authority over virtually the entire state, Del Norte County and its residents must push through more regulatory red tape in order to build and develop their land. It’s a sad day when a state agency that is designed to protect property from disasters creates a court-sanctioned regulatory disaster for California’s residents. Update 1000 May 1: 274 acres - 100% contained ful control by Wednesday evening. Update 2200: 187 acres 50% contained. Full containment expected tomorrow morning. Red Flag Warning 5AM Wednesday until 5PM PDT Thursday Kern County Mountains and Tulare County Mountains. Windy conditions will continue through 1100 pm tonight along the west side of the San Joaquin Valley and over the eastern slopes of the Kern county mountains/western desert region. Areas of blowing dust and sand will be possible. Motorists are urged to use caution while traveling and be prepared for sudden changes in conditions along Interstate 5, highway 99 near Merced and along highway 152 from Chowchilla through Pacheco Pass, as well as along highway 198 from Coalinga to Hanford. In the desert travel may be impacted along highs 58 and 14. Use caution when driving through these areas, especially high profile vehicles, and watch for sudden drops in visibility due to blowing dust and sand. Critical Fire Weather: A Red Flag Warning is in effect from 5AM Wednesday until 5PM PDT Thursday for the Kern County Mountains and parts of the Tulare County Mountains. A Red Flag Warning means that a combination of hot temperatures, dry humidity, and gusty winds will create a critical fire weather threat. A RED FLAG WARNING MEANS THAT CRITICAL FIRE WEATHER CONDITIONS ARE EITHER OCCURRING NOW... OR WILL SHORTLY. A COMBINATION OF STRONG WINDS... LOW RELATIVE HUMIDITY... AND WARM TEMPERATURES WILL CREATE EXTREME FIRE BEHAVIOR. THE TEENS AND SINGLE DIGITS WITH POOR OVERNIGHT RECOVERIES. * WINDS: NORTHEAST 20 TO 30 MPH WITH GUSTS TO 55 MPH. AGAIN WEDNESDAY NIGHT AND THURSDAY MORNING. LITTLE OR NO RECOVERY WEDNESDAY NIGHT. LOWER ELEVATIONS TO THE 70S TO LOWER 80S AT HIGHER ELEVATIONS. OVERNIGHT LOWS IN THE 50S AND 60S. THIS HAZARDOUS WEATHER OUTLOOK IS FOR SOUTHWESTERN CALIFORNIA. DAYS TWO THROUGH SEVEN: WEDNESDAY THROUGH MONDAY GUSTY OFFSHORE WINDS AND EXTREMELY DRY AND WARM CONDITIONS WILL BRING CRITICAL FIRE WEATHER CONDITIONS TO INTERIOR PORTIONS WEDNESDAY THROUGH FRIDAY. THESE WINDS WILL ALSO BRING HAZARDOUS DRIVING CONDITIONS FOR HIGH PROFILE VEHICLES WEDNESDAY AND THURSDAY. HIGH TEMPERATURES NEAR 100 AND APPROACHING RECORDS ARE EXPECTED FOR THE END OF NEXT WEEK OVER THE WARMEST VALLEYS. DISCUSSION: POTENTIAL OFFSHORE WINDS WITH VERY WARM AND DRY CONDITIONS FOR INTERIOR SOUTHWEST CALIFORNIA BY MIDWEEK. ELEVATED FIRE DANGER FOR INTERIOR SOUTHWEST CALIFORNIA WEDNESDAY THROUGH FRIDAY. AN UPPER LEVEL TROUGH IS EXPECTED TO DIVE SOUTHWARD ACROSS THE GREAT BASIN INTO THE FOUR CORNERS AREA ON WEDNESDAY. WHILE AN UPPER LEVEL HIGH PRESSURE SYSTEM BUILDS OFF THE COAST OF NORTHERN CALIFORNIA. SURFACE HIGH PRESSURE WILL BUILD OVER THE GREAT BASIN WEDNESDAY INTO THURSDAY POTENTIALLY SETTING THE STAGE FOR A LATE SEASON OFFSHORE WIND EVENT FOR SOUTHWEST CALIFORNIA. AT THIS POINT THERE IS STILL SOME UNCERTAINTY IN THE STRENGTH AND AREAL EXTENT OF THE OFFSHORE WINDS. HOWEVER THERE ARE PRELIMINARY INDICATIONS THAT MODERATE OFFSHORE WINDS COULD DEVELOP AS EARLY AS WEDNESDAY ACROSS THE MOUNTAINS AND DESERTS SPREADING INTO THE VALLEYS OF LOS ANGELES AND VENTURA COUNTIES LATE WEDNESDAY INTO THURSDAY. WEAKER OFFSHORE FLOW WILL LIKELY CONTINUE INTO FRIDAY. THERE IS GROWING CONFIDENCE OF AN EXTENDED PERIOD OF VERY WARM AND DRY CONDITIONS FOR INLAND AREAS FROM WEDNESDAY THROUGH FRIDAY. THE WARMEST DAYS WILL LIKELY BE THURSDAY AND FRIDAY WHEN MOST VALLEY AREAS COULD SOAR INTO THE 90S. IT IS STILL QUESTIONABLE HOW MUCH WARMING THERE WILL BE NEAR THE COAST AS A SHALLOW MARINE LAYER INFLUENCE MAY MODERATE TEMPERATURES. THE OFFSHORE WINDS WILL ALSO BRING THE POTENTIAL FOR PROLONGED PERIODS OF SINGLE DIGIT HUMIDITIES ACROSS INTERIOR SECTIONS WEDNESDAY THROUGH FRIDAY. DURING THIS TIME THE VERY LOW HUMIDITIES IN COMBINATION WITH THE GUSTY OFFSHORE WINDS AND VERY WARM TEMPERATURES WILL BRING ELEVATED FIRE DANGER TO INTERIOR PORTIONS OF SOUTHWEST CALIFORNIA ESPECIALLY CONSIDERING THE UNUSUALLY DRY FUELS FOR THIS TIME OF YEAR. 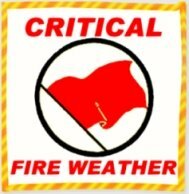 AS WE DRAW CLOSER TO THE EVENT A FIRE WEATHER WATCH HAS BEEN ISSUED FOR THE POTENTIAL OF CRITICAL RED FLAG CONDITIONS. THIS HAZARDOUS WEATHER OUTLOOK IS FOR THE NORTH AND EAST BAY HILLS OF THE SAN FRANCISCO BAY REGION . DAY ONE: TUESDAY AND TUESDAY NIGHT NORTH TO NORTHEAST WINDS WILL INCREASE IN THE HILLS LATE TODAY. BY LATE THIS EVENING WIND GUSTS AS HIGH AS 50 MPH ARE POSSIBLE ACROSS RIDGES AND PEAKS. LOCALLY STRONG AND GUSTY WINDS WILL CONTINUE. DAY TWO: THROUGH TUESDAY NIGHT AND INTO WEDNESDAY MORNING. WINDS WILL THEN DECREASE BY WEDNESDAY AFTERNOON. THESE LOCALLY STRONG AND GUSTY WINDS MAY RESULT IN DOWNED TREES AND POWER LINES AND LEAD TO POWER OUTAGES. WIND ADVISORY HAS BEEN ISSUED FOR THE NORTH AND EAST BAY HILLS FOR ELEVATIONS ABOVE 1000 FEET FROM 5 PM TUESDAY THROUGH 11 AM WEDNESDAY MORNING. RED FLAG WARNINGS HAVE BEEN ISSUED FOR THE NORTH AND EAST BAY HILLS AS WELL FROM 6 PM TUESDAY THROUGH 6 PM WEDNESDAY. THE COMBINATION OF RECORD OR NEAR RECORD DRY FUELS ALONG WITH HOT AND DRY WEATHER WILL CREATE A CRITICAL FIRE WEATHER PERIOD DURING THIS 24 HOUR WINDOW. CONTINUED WARM AND DRY THURSDAY THROUGH SATURDAY WITH SOME COOLING BY SUNDAY. SPOTTER INFORMATION STATEMENT... WEATHER SPOTTERS ARE ENCOURAGED TO REPORT SIGNIFICANT WEATHER CONDITIONS PER STANDARD OPERATING PROCEDURES. RED FLAG WARNING SAN FRANCISCO BAY AREA - STRONG NORTH TO NORTHEAST WINDS WILL DEVELOP TONIGHT INTO WEDNESDAY. URGENT - FIRE WEATHER MESSAGE NATIONAL WEATHER SERVICE SAN FRANCISCO BAY AREA 432 AM PDT TUE APR 30 2013 . STRONG NORTH TO NORTHEAST WINDS WILL DEVELOP TONIGHT INTO WEDNESDAY. THE STRONGEST WINDS WILL BE DURING THE OVERNIGHT AND EARLY MORNING HOURS OF WEDNESDAY WHEN WIND GUSTS IN EXCESS OF 50 MPH WILL BE POSSIBLE ACROSS THE HILLS. WINDS WILL BEGIN TO DECREASE BY WEDNESDAY AFTERNOON BUT TEMPERATURES WILL REMAIN HOT WITH VERY DRY RELATIVE HUMIDITY VALUES. * AFFECTED AREA: FIRE ZONE 507 NORTH BAY MOUNTAINS. INCLUDES ALL LOCATIONS ABOVE 1000 FEET IN MARIN...SONOMA AND NAPA COUNTY INCLUDING MOUNT SAINT HELENA AND MOUNT TAMALPAIS. * TIMING: FROM 6 PM TODAY THROUGH 6 PM WEDNESDAY WITH THE PERIOD OF STRONGEST WINDS ROUGHLY FROM 1 AM WEDNESDAY TO 10 AM WEDNESDAY. * WIND: NORTH TO NORTHEAST SUSTAINED 20 TO 35 MPH WITH FREQUENT GUSTS TO 50 MPH AND LOCAL GUSTS TO 60 MPH OVER THE HIGHER PEAKS OF NAPA COUNTY ALONG THE YOLO AND LAKE COUNTY BORDERS. * HUMIDITY: AFTERNOON MINIMUM 15 TO 20 PERCENT...STAYING LESS THEN 30 PERCENT OVERNIGHT. * IMPACTS: THE COMBINATION OF RECORD DRY FUELS...NEAR RECORD WARMTH ALONG WITH STRONG AND DRY OFFSHORE WINDS WILL INCREASE THE PROBABILITY OF NEW FIRE IGNITIONS. A COMBINATION OF STRONG WINDS...LOW RELATIVE HUMIDITY...AND WARM TEMPERATURES WILL CREATE EXPLOSIVE FIRE GROWTH POTENTIAL. Pilot and crew will be buried, as a group, on May 2 at Arlington National Cemetery. Navy Lt. Dennis W. Peterson of Huntington Park, Calif., was the pilot of a SH-3A helicopter that crashed in Ha Nam Province, North Vietnam. Peterson was accounted for on March 30, 2012. Also, aboard the aircraft was Ensign Donald P. Frye of Los Angeles, Calif.; Aviation Antisubmarine Warfare Technicians William B. Jackson of Stockdale, Texas; and Donald P. McGrane of Waverly, Iowa. The crew will be buried, as a group, on May 2 at Arlington National Cemetery. "video and eyewitness accounts are leading many who know to speculate that either the aircraft was improperly loaded with an aft center of gravity, or that the cargo shifted during the climb-out and moved the center of gravity too far to the rear." It sent a chill down my spine and I am not in the career field listed in the title, though I do occasionally get to fly in cargo aircraft with heavy stuff tied down in the back during high angle departures. A Boeing 747 departing Bagram Air Base in Afghanistan. A civilian aircraft under contract to the US Military, transporting military vehicles. Although no one yet knows for sure what caused the accident, the video and eyewitness accounts are leading many who know to speculate that either the aircraft was improperly loaded with an aft center of gravity, or that the cargo shifted during the climb-out and moved the center of gravity too far to the rear. Regardless, at least eight people lost their lives. In this era of everything monitored by video and everyone carrying around a smart phone, it was inevitable that the event was captured on camera. Chilling to say the least, yet I had to watch it several times. You would think that I have seen enough crap like that over my lifetime, yet here we are. I guess that it proves that I, like every other Schmoe I know, am human and find stuff like this fascinating. What kind of ghoul does that make me? Learning Objective: The student shall be able to calculate air pressure changes in a sprinkler system that result from temperature fluctuations. During a dry pipe sprinkler system pneumatic test, a change in ambient temperature may cause the air in the system to expand or contract, resulting in what may appear to be an inconsistent pressure reading on the test gauge. To account for changes in air temperature, the inspector can use the following formula to assure the minimum requirement of 40 pounds per square inch (2.8 bar) has been sustained. It is important to note that for the formula to work, the temperatures need to be converted to the Rankine scale by adding 460 to the recorded temperature in Fahrenheit (273 for Celsius). Here is an example in American Standard units where the temperature increases from 43 F to 78 F during the 24-hour test when the sprinkler system is pressurized to 40 psig and it is assumed that the system is at sea level. If there are no leaks in the system, the formula will provide the gauge pressure that would be expected at the end of the test. In the second example, even though the gauge pressure reads less than the beginning 40 psig, the inspector can conclude that the system has passed the pressure test and the lower gauge reading is due to temperature fluctuations. 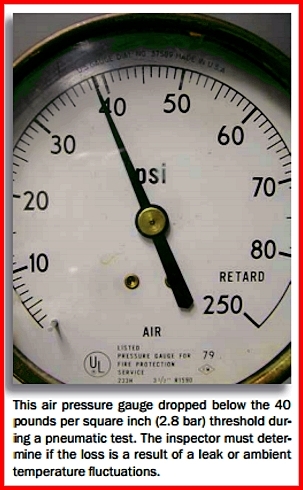 This air pressure gauge dropped below the 40 pounds per square inch (2.8 bar) threshold during a pneumatic test. The inspector must determine if the loss is a result of a leak or ambient temperature fluctuations. Redding / Weaverville – The California Department of Forestry and Fire Protection (CAL FIRE, Shasta and Trinity Counties) will be requiring burn permits for dooryard burning in areas over 1,000 feet in elevation beginning 8 a.m., Wednesday, May 1, 2013. Dooryard burning below 1,000 foot elevation will be prohibited. CAL FIRE Unit Chief Rick Kyle would like to remind residents to take extra precautions when conducting dooryard burning operations. Even when burning with all the proper permits and on a permissible burn day, a fire can still escape the control of the person conducting the burn. Even though the grass and vegetation is green, it will still burn. In addition to the drying grasses, there are layers of dead grasses and vegetation underneath the green that will spread a fire if the burn piles do not have the proper clearance. Windy conditions can also be a factor in the drying of vegetation and the escape of a control burn. Remember to consider the weather as well as your clearance when conducting debris burns. This time of year can be especially dangerous as fires tend to escape control once the drying cycle has begun. Persons responsible for escaped debris burns can, and may be held criminally and civilly responsible for the cost of suppressing the fire as well as any violations of the permit or other burning regulations. All dooryard burning below 1,000 feet will end on April 30, 2013. Contact your local fire department or CAL FIRE to determine what permit requirements or burning restrictions apply in your area. CAL FIRE may be contacted at (530) 225-2418. In Trinity County, the North Coast Unified Air Quality Management District (NCUAQMD) requires that all burn operations, including residential/dooryard and agriculture/hazard reduction, must obtain an AQMD burn permit prior to burning. AQMD burn permits may be obtained on-line at www.ncuaqmd.org or by calling (707) 443-3093. For burn day status, call (NCUAQMD) at (707) 443-7665 or (866) 287-6329. MEDIA ADVISORY Action Packed PhotoOpportunities! Who: The Orange County Fire Authority’s(OCFA) Fire Academy 38 will graduate 34 recruits to the rank of Firefighter after a long 16-week academy. OCFA Board Chairman, Trish Kelley, will speak along with Fire Chief Keith Richter. What: Thirty-four men with various backgrounds, previous job experiences, diverse family lives, and collegiate and professional sports experience will marchinto the OCFA drill grounds at their graduation ceremony where they will receive their Firefighter badge. The recruits will showcase what they have learned in the past few months, conduct formal presentations, and the instructors will hand out performance and inspirational awards. Don’t miss the end of this ceremony, as the recruits show you first-hand what they have experienced within the academy. From chainsaws cutting metal to rappelling down the tower, the new Firefighters will show off their skills and training in an action-packed 30-minute drill. When: Wednesday, May 1st @ 5 p.m.
OCFA MEDIA ADVISORY: Amazing Photo Op - Ready, Set, Go! Who: The Orange County Fire Authority (OCFA) in partnership with the Orange County Sheriff’s Department (OCSD) along with Orange County Parks will announce their joint efforts in preventing man-made, arson, or wildfires within Orange County and placing an emphasis on OCFA’s program Ready, Set, Go! What: OCFA Fire Chief Keith Richter, Sheriff Sandra Hutchens, and OC Parks Director Mark Denny will outline what their agencies are doing to prevent wildfires. They will discuss how to fire proof your home, what to look for in reference to suspicious behavior, and who to call for notification. We are enlisting the community to be the “eyes and ears” in preventing Wildland fires. Fire is a severe hazard for those communities that are built close to nature and residents need to be involved in order to prevent future blazes. Working together with partners and residents are among our best prevention tools. We want “would-be” arsonists to know that they will be seen. There will be LIVE demonstrations of an OCFA Hand Crew performing progressive hose lays and cutting line; Agency helicopters conducting water drops as well as showing video downlink from their helicopter, which is a valuable resource on wildfires. OCFA and OCSD will display their new command/rehabilitation trailers along with OCFA’s urban interface engines. When: Wednesday, May 1st @ 10:30 a.m.Staging begins at 10 a.m.
Amazing Photo & Interview Opportunities Available! With much of the West mired in drought conditions heading into the summer, the U.S. Forest Service is preparing for what could be another damaging wildfire season. This year, firefighters will be armed with an updated tool to help them battle fires with the precision of special forces on the battlefield. The instrument, known as the “ Autonomous Modular Sensor,” or AMS, can help the Forest Service detect wildfires and conduct post-burn assessments. While similar devices have been in use for several years, scientists at NASA’s Ames Research Center in Moffett Field, Calif., working with the Forest Service, recently deployed a new version with expanded capabilities that will allow firefighters on the ground to request overflights during the day, when wildfires tend to be most active. Previously, such flights were conducted at night due to the limitations of the older generation instrument. “Being able to fly during the day would give us an additional capability that we don’t currently have,” said Everett Hinkley, the director of remote sensing for the Forest Service. The new sensor transmits data in near real-time to crews on the ground to analyze and improve decision making. The new instrument operates like a spinning mirror, and it paints a stripe on the ground perpendicular to the motion of flight, scanning that land for signs of heat and other characteristics that mark wildfire activity, Hinkley said. It provides a higher resolution overview of a wildfire compared to satellites, which can also detect burn areas, but don’t have a high enough resolution to allow the images to be used for tactical firefighting decisions, such as where to place “hotshot” crews, and where to conduct airborne water drops. The Forest Service has installed the new instrument on a Cessna Citation Jet, and may add it to a King Air turboprop aircraft. It will be capable of scanning 100,000 acres per hour, for a total of about 1,000 square miles, during a typical 6-hour flight, Hinkley said. Most wildfires are far smaller than 100,000 acres, but data show that large blazes are becoming more common as average temperatures increase in the West, due in part to global warming, and spring snowmelt occurs earlier in the year. In addition, land use changes have helped contribute to more wildfires as communities expand into previously unoccupied land. Compared to the average year in the 1970s, during the past decade there were seven times more fires greater than 10,000 acres each year, and nearly five times more fires larger than 25,000 acres each year, according to Climate Central research. In addition to serving in a fire-detection role, the AMS instrument can also conduct forest health analyses, post-fire burn conditions, and be used to generate burn severity maps, Hinkley said. Hinkley said the instrument gives incident commanders on the ground key intelligence for battling blazes. He called the AMS instrument one of the “biggest vacuum cleaners” of data for fire mapping, since it can scan such a large area in a short period of time. The Forest Service owns 22 aircraft, and during wildfire season it can contract up to 800 planes for firefighting. Hinkley said the new instrument was designed to run autonomously, which makes it ideally suited for possible future use with unmanned aircraft (UAVs), such as Predator drones, that the Forest Service is considering acquiring for a fire detection role in the future. “We’re very anxious to start using unmanned aerial vehicles over fires,” Hinkley said, noting that the agency has been evaluating the potential uses of UAVs for the past decade. The agency does not plan to use UAVs during the 2013 wildfire season, however. In fact, budget cuts have threatened the agency’s ability to deploy sufficient assets to combat this season’s wildfires, and the agency has requested $74 million during Fiscal Year 2013 and 2014 to modernize its airtanker fleet. Autonomous Modular Sensor overview: The Autonomous Modular Sensor (AMS) is an airborne scanning spectrometer that acquires high spatial resolution imagery of the Earth's features from its vantage point on-board low and medium altitude research aircraft. Data acquired by AMS is helping to define, develop, and test algorithms for use in a variety of scientific programs that emphasize the use of remotely sensed data to monitor variation in environmental conditions, assess global change, and respond to natural disasters. The AMS is no longer maintained and operated by the Airborne Sensor Facility. AMS was transferred to the United States Forest Service (USFS) under a 2012 agreement between NASA and the Department of Agriculture. 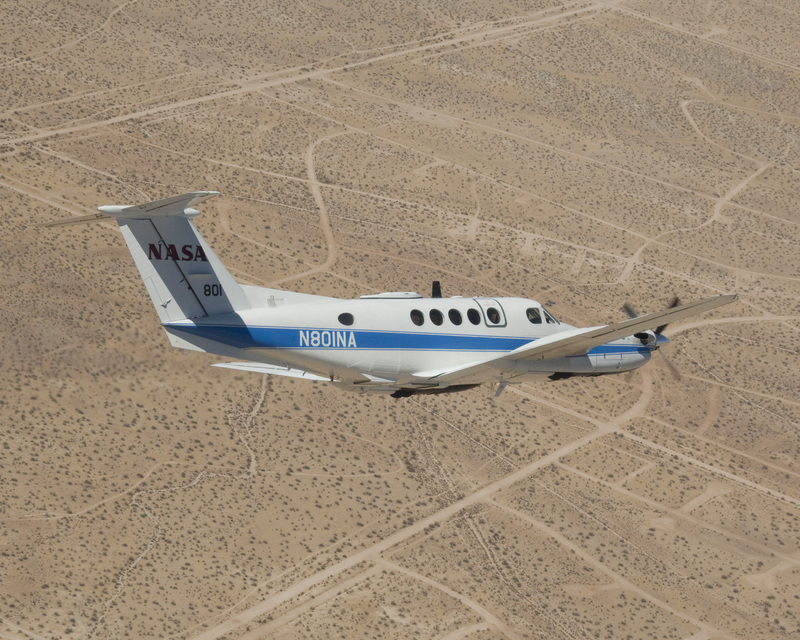 The USFS plans to use it in operational fire imaging and measurement aboard their Cessna Citation aircraft during the active fire season. AMS will also support other agency objectives, such as vegetation inventory analysis and water and river mapping.